Sisters Elizabeth Ann and Miss Mollie make the final preparations for their annual Christmas tea. With an assortment of treats baked and the table set for the guests to arrive, everything is just about ready, but they have a problem. What will they do with their eight rambunctious cats? The sisters decide to stow the critters in an upstairs room with cat food, until the guests leave the party. As the girls eat the delicious desserts and giggle out loud, the festive fete proves to be a success. But the felines do not want to miss another minute of the fun, so they decide to break loose. Clawing and pawing at the door knob, they finally escape and crash down the stairs. Chaos ensues! Will these eight cats wreak havoc on the Christmas party? Bright illustrations and fun rhymes complete this hilarious tale. Nancy K. Wallace is the youth services coordinator for the Ellwood City Area Public Library. In addition to reviewing books for VOYA magazine, she has contributed articles to such publications as LibrarySparks and Highlights High Five. Under Wallace’s direction, her library received five Best Practice Awards from the Pennsylvania Library Association, which honors excellence in library early learning programming. She earned a BA in English literature from Maryville College and her library certification from Northampton College. Wallace lives in Ellwood City, Pennsylvania. Cathren Housley is an artist whose work includes illustration, fine arts, and sculpture. In addition to teaching art at museums, she created a line of inspirational jewelry. Housley is a graduate of the Rhode Island School of Design with a degree in children’s book illustration and a recipient of a Silver Mom’s Choice Award. She lives in East Providence, Rhode Island. 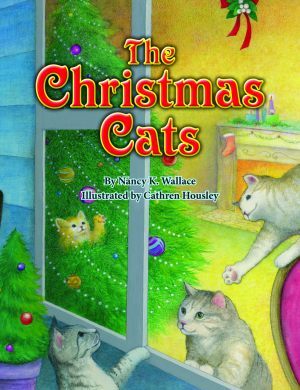 Click here for the activity guide for The Christmas Cats.